Representative Spanberger resides in Glen Allen, Henrico County, Virginia with her husband, Adam, and their three children. In July 2017, Spanberger announced her candidacy for the United States House of Representatives in Virginia’s 7th congressional district in the 2018 election against Dave Brat. She made the final decision to run in the wake of the House of Representatives’ vote to repeal the Affordable Care Act. On June 12, 2018, Spanberger defeated Dan Ward in the primary election for the Democratic Party nomination with 73% of the vote, receiving more votes than any other candidate in the Virginia primaries that day. Her campaign out-raised Brat’s campaign. She won the seat by a narrow margin on November 6, defeating Brat by just over 6,600 votes. While Brat won five of the district’s seven counties, Spanberger dominated the two largest counties, Henrico and Chesterfield, by a combined margin of over 30,000 votes; her margin in either county would have been enough individually to give her the victory. Spanberger’s victory ended a 38-year hold on the district by Republicans; it had previously been numbered as the 3rd District before 1993. Tom Bliley won the seat in 1981 and handed it to future House Majority Leader Eric Cantor in 2001. Cantor held it until Brat upset him in the 2014 primary. Spanberger was sworn into the U.S. House of Representatives for her first term on January 3, 2019. In the election for Speaker of the U.S. House of Representatives on the opening day of the 116th United States Congress, Spanberger voted for U.S. Representative Cheri Bustos, an Illinois Democrat, for speaker. Spanberger maintained her campaign promise to support new leadership in the House. I believe every person should be treated with dignity and have equal rights under the law. No person in a free and fair society should make less money, be denied government services, pay more for healthcare, lose a job or housing opportunities, or face discrimination in the community or workplace because of their gender, race, creed, national origin, disability, whom they love, or anything else that defines them. I support protecting women’s access to reproductive healthcare and federal funding to Planned Parenthood and other providers that ensure essential healthcare to women and men. I will work to protect marriage equality and LGBTQ rights. I also support the passage of the Equal Rights Amendment. I support the rights of individuals with disabilities and will work to protect the civil rights protects afforded under the Americans with Disabilities Act (ADA). We must pursue criminal justice reform. We are five percent of the world’s population, but have 25 percent of the world’s prisoners. We need criminal justice reform to ensure that our justice system is fairly sentencing offenders regardless of race or economic status, and that we’re addressing issues related to addiction in our jails and prisons. I also support bolstering reentry efforts, which reduce recidivism and ensure that those who have paid their debt to society have the knowledge and resources necessary to become employed and engaged community members. The Citizens United ruling is one of the most destructive decisions ever handed down by the U.S. Supreme Court. It ushered in an era of unchecked and unaccounted for political spending, and our nation has paid a dear price for it. I support campaign finance reform and efforts to reduce the influence of money in politics. I support efforts to bring greater transparency to campaign finance, overturn Citizens United, and block illegal foreign funds from influencing our elections. As we’ve increasingly dealt with the effects of special interests in campaign finance, it’s important that all elected officials take a stand against letting a small group of funders influence our elections. And because my commitment to campaign finance reform starts now, with my campaign, I will not accept any corporate PAC donations. I am proud that our campaign has earned the support of End Citizens United, a national organization committed to fighting for campaign finance reform. As a Virginian, I’ve seen the negative effects of gerrymandering. We need fairly-drawn, non-partisan districts to ensure the health of our representative democracy. As a proud graduate of Henrico County Public Schools and as a mother of children who attend public schools, I believe deeply in the value of public education. I will advocate for and work to strengthen our public education system. I support building more skills/career training and apprenticeship programs for Americans whose path to employment does not include a four-year degree. For those who attend two and four-year colleges, we should ensure that they are not saddled with debt when they graduate and enter the workforce. I will be a tireless advocate for our nation’s students from the day they enter school to the day they graduate. As a kid, I cherished the time I spent outdoors, trekking through the woods or picnicking in parks with my family. As an adult, I know how lucky we are to have Virginia’s mountains, rivers, and beaches. It is our responsibility to protect these resources for our children and generations to come by investing in alternative and renewable energy sources and decreasing air and water pollution. Energy independence is good for the environment and good for the economy — solar energy job growth climbed 65% from 2015-16 in Virginia, making the Commonwealth one of the fastest growing solar job markets in the nation. We must do everything we can to seize this opportunity. Climate change is real, and we’re already seeing the effects right here in Virginia with rising sea levels, higher average temperatures, and stronger hurricanes. An investment in clean, renewable energy is an investment in our ecosystem, our health, and our economy. These efforts require significant coordination, as well as a shared baseline of facts, and I will stand up to attacks against science. I will work to ensure that every person has quality, affordable healthcare. No one should have to choose between putting food on the table and getting the care, medication, or life-saving treatments they need. No one should lose or be denied coverage because of a pre-existing condition, and no one fighting a serious illness should face the fear of lifetime coverage caps. We can improve our healthcare system, while lowering costs, ensuring greater coverage, and achieving better outcomes, but it will take tremendous political will and a commitment to creatively looking at the options. Assaults against the ACA, such as the removal of the individual mandate, are causing rising premiums and losses of coverage across our district and country. I support measures that would strengthen the framework of the ACA such as reinstating the individual mandate, which mitigates risk, and moving the enrollment deadline to align with tax day. To increase coverage nationwide, I support pursuing universal coverage through a public option, specifically the proposed Medicare-X Choice Act currently before the U.S. Senate. I support Medicare, Medicaid, and CHIP and the vital resources they provide to our seniors and most vulnerable citizens and children. I also support protecting women’s access to reproductive healthcare, including federal funding to Planned Parenthood and other providers that ensure essential healthcare to women and men. Last year, drug overdoses remained the #1 cause of unnatural death in Virginia for the 4th straight year. The opioid crisis is having a serious impact on our communities and our economy, and we need to start thinking of new ways to address the problem. We must stop treating drug addiction as a crime. Substance use disorders are a health issue, and those suffering from them are in dire need of treatment. We must treat this epidemic by studying the problem and all possible solutions. Adding to our already overcrowded jails and prisons is not the solution, and will not provide those battling addiction with a path to recovery. I support addressing prescribing practices, advocating for recovery programs, and working with law enforcement and our jails to ensure better outcomes. Access to broadband internet provides economic and educational opportunities, and I support efforts to bring broadband access to everyone here in the 7th and in underserved communities across the country. I also support net neutrality. Legislation protecting net neutrality is vital to ensuring that the internet remains a conduit for free speech and a free market, and that it’s available to those who rely on the internet to create opportunities or grow their business, whether they’re working from home in Louisa or managing a farm in Culpeper. It is an essential service to small businesses, educators, and everyday citizens alike, and it must become and remain equally accessible to all users. Advancements in technology have radically restructured the global economy. While these changes bring many benefits, they have also altered the employment landscape for many Americans. We must take steps to acknowledge and understand how this impacts individuals, salaries, and the economic growth across our country, so that we can plan accordingly and ensure that our workforce training meets the needs of the changing economy. Our strength as a nation comes from the idea that anyone with a good idea can make it happen — the recent craft brewing renaissance we’ve experienced throughout central Virginia is just one example. This is why I support policies that empower small businesses (the backbone of our economy) to innovate and pursue bold entrepreneurial ventures. I also recognize that, despite living in an era of historic corporate profitability, people are working harder and harder, but their incomes are not keeping up with their expenses. Congress has had more than enough time to reinforce the middle class by prioritizing the people and small businesses that keep our economy strong; I will make them a priority. I also support organized labor, as unions have historically been a driver of economic stability within America’s middle class. This has been true for my own family, as my grandfather, a member of the International Union of Painters and Allied Trades, was able to raise his four children as a young widower because of the stability his union employment provided. As we see a changing landscape of employment opportunities, union apprenticeship programs remain an invaluable asset as they train the next generation of skilled workers. We need comprehensive tax reform, but what Congress just passed is not it. We need tax reform that makes our tax system simpler and more fair, and strengthens our middle class. Congress must also work across party lines to address our nation’s debt and deficit issues. We can’t keep adding hundreds of billions of dollars to our debt each year. We must find common sense solutions to cut wasteful spending without penalizing hard-working families, seniors, or future generations. When considering budgetary issues, I will put the needs of the middle class first and fight to end corporate giveaways that send profits and jobs overseas. I worked to keep our country safe as an officer in the CIA’s clandestine service, and I will continue to work in support of our national security as a member of Congress. Our elected leaders should understand and acknowledge the interconnected nature of our national security, our foreign policy, and our economic prosperity. We must also continue to value and support our military, diplomats, intelligence officers, and civil servants, as they work together to serve our country and protect our nation. Thousands of Americans die each year due to violence, suicide, or accidents involving firearms, and our lawmakers’ unwillingness to address this problem leaves our citizens and our children vulnerable. I am a former federal law enforcement officer, I used to carry a gun every day, and I support responsible gun ownership, but the ever-increasing number of Americans who die each day requires that we take action. Addressing gun violence and protecting lives should not be a political issue; it is a public safety issue. I support background checks for all firearm purchases, regardless of where or from whom the purchases are made. States that require background checks for all purchases have fewer suicides by gun, fewer law enforcement officers shot and killed, and fewer women killed by an intimate partner. Ninety four percent of Americans support background checks for all firearms purchases, as well as the Law Enforcement Partnership to Prevent Gun Violence and the Virginia Association of Chiefs of Police. I support common sense gun policy, such as HR 2598, the Gun Violence Restraining Order Act of 2017. The implementation of Gun Violence Restraining Orders allow family, friends, and law enforcement to help people facing crisis who, with a firearm in their possession, might be a risk to themselves or others. I support ensuring that states have the ability to provide current information to the NICs database to ensure informed background checks, and I support funding the research of gun violence. I also support the proposed HR 5087, the Assault Weapons Ban of 2018. Thoughts and prayers are not enough. Members of Congress must have the courage to address this problem and implement policies that will help keep our children and communities safe. Unemployment, homelessness, and suicide rates among our nation’s veterans are unacceptably high, and I will work to ensure that we, as a country, make the process of transitioning from active duty to civilian life a positive one for our veterans. I will work to ensure veterans’ continued access to quality healthcare through our VA system, and I will work to strengthen existing efforts to improve our veterans’ transitions to the civilian workforce through credentialing, education, and job training programs. Abigail Spanberger, Democratic candidate for Congress in Virginia’s 7th District speaks with MSNBC’s Thomas Roberts about the new bipartisan health care bill introduced in the Senate. If you have any questions for Abigail Spanberger, send them to Virginia onAir at virginia@onair.cc. Virginia will first see if Abigail Spanberger has answered your question somewhere else. If they haven't, Virginia will pass on your question to Abigail Spanberger and post their answer, if they have one. 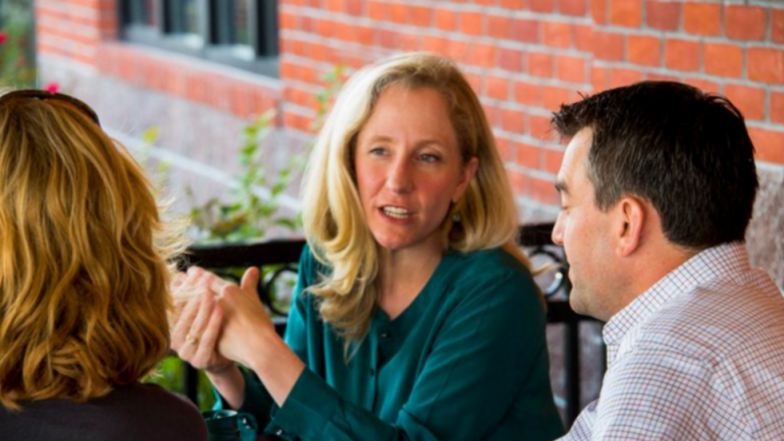 If you have any suggestions for Abigail Spanberger, especially if you are a current or former constituent, send them to Virginia onAir at virginia@onair.cc. Virginia will record your suggestions here. If you have something positive to say about Abigail Spanberger and you are a Virginia onAir Hub member, send your recommendations to Virginia onAir at virginia@onair.cc.